The Florida Medical Clinic Foundation of Caring selected Pasco Kids First as a grant recipient in the amount of $11,250. 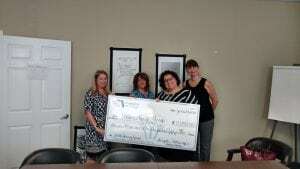 The Foundation CEO Angela Pottinger and Development Coordinator Chrissy Bond toured the Pasco Kids First Children’s Advocacy Center in New Port Richey and presented the check to Kelly Plouffe the Trauma Treatment Team Director. The funds from the grant are being used to provide therapy and case management services for children who have experienced a traumatic event. The Foundation encourages philanthropy in all its forms; gifts of time, talent and treasure to leverage support from the Clinic, employees, providers, vendors, community groups and individuals. The FMC Foundation of Caring was founded in 2005 and has granted more than $2.2 million to local non-profits who met important community needs. To learn more visit: http://fmcfoundationofcaring.org.